Because Fridays are always better with a Happy Dance! Or … maybe … because my previous post on Animated Storytelling is the perfect excuse set up for posting a dance sequence that ALWAYS makes me laugh ... 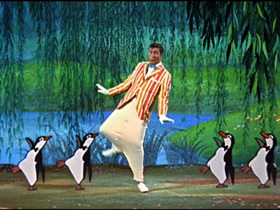 The dancing penguins sequence from Walt Disney’s “Mary Poppins”! I especially love the penguin who toboggans off-screen, and then – try as he might – can never get back in sync with the group. I think that’s because I frequently feel like I’ve gone barreling off the map and am forever out of step with everyone else! What movie always makes you laugh, and why? Ah, what’s not to love about Mary Poppins, right? Another great scene in one of my favorite movies. Even after hundreds of viewings, When Harry Met Sally never fails to make me laugh. It’s a classic in my book. Me too! I’m embarrassed to admit how many times I saw Harry Met Sally in the movie theaters (not to mention the times I’ve watched it on DVD), and I laugh every time. The dialog is fabulous, as are the characters and scenes. Truly terrific screenwriting, character development, and storytelling. Beauty and the Beast is WONDERFUL! No need to keep that fave a secret! There are so many wonderful moments in that movie. Priceless. You know, I can’t remember if I’ve ever seen Mary Poppins all the way through. If I have, it’s definitely been many, many years. Oh, that is such a great movie.. My little guy is almost old enough for it, too!